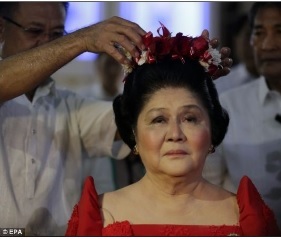 On her 85th birthday, Imelda Marcos prayed for strength to prolong her existence. In response, God gave her formalin. According to Imelda, she had seen the “worst, worst, worst” in life. That’s what happens when you spend so much time in front of the mirror. On her birthday, Imelda visited her constituents and handed them cash gifts. The people thanked her for giving them back their money. To mark her 85th birthday, Imelda visited the refrigerated body of her husband, Ferdinand Marcos. When she planted a kiss on the glass coffin though, he gave her the cold shoulder. 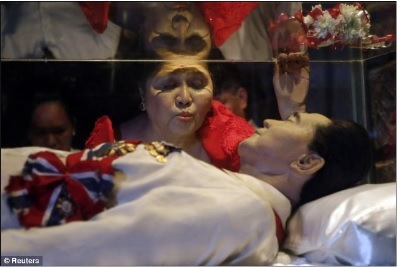 On her birthday, former First Lady Imelda Marcos dramatically planted a kiss on her husband’s glass coffin. She then waxed poetic about the late dictator. Imelda Marcos is confident of reclaiming Malacañang through her son Bongbong Marcos. If Marcos Jr. gets elected, his wife Louise will have too many shoes to fill. Surrounded by her loyal supporters, Mrs. Marcos was crowned with flowers on her birthday. That tribute was moving. Her face wasn’t. The Supreme Court has ruled that the Abad Aquino administration’s Disbursement Acceleration Program was unconstitutional and therefore, illegal. What did Malacanang say? “DAP was used to accelerate projects to help benefit the country and our countrymen. DAP was used for noble projects that benefited the people.” These were the exact words of palace spokesman Edwin Machiavelli. Militant party-list group Gabriela gave Nora Aunor an”Artista ng Bayan” award for her “exemplary performance” in the 1976 film ‘Minsa’y Isang Gamu-gamo,’ a movie that was critical of American military presence in the Philippines. When told of the award, the Superstar instructed her secretary to draft a ‘Thank You’ note which she plans to give Gabriela in 2052. Some people are being mean to Batangas Governor Vilma Santos. 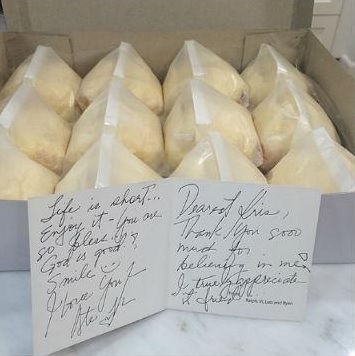 They are mocking her grammatical lapses in a note sent to Kris Aquino. She misspelled the world ‘truly.’ Governor Vi has since apologized and admitted she was a former Starbucks barista. Kris Aquino has also said sorry to Governor Vi. The TV host explained she posted the ‘Thank You’ note in ‘good faith.’ Kris is now the frontrunner for the post of palace spokesperson. A drunk Shia LaBeaouf was recently arrested for disrupting a Broadway musical. 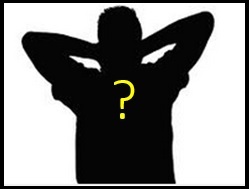 The good news is the 28-year-old actor is getting treatment for alcohol addiction. The bad news is he won’t win a National Artist award. He is a high-profile politician; married with children. He projects a ‘loyal to my wife’ image. He is not a womanizer. He would take his conquest abroad, far from the madding Filipino crowd. Clue? ‘Wag na lang. Sakyan na lang natin ang hilig niya. AFTER FORTY-TWO years in power and 112 ways to spell his name, Moammar Gaddafi is dead! Libyan dictator Moammar Gaddafi is dead. His son Bongbong Gaddafi wants a state funeral for his father. Libyan tyrant Moammar Gadhafi is dead. Just to be sure, Tito Sotto wants to see the death certificate. Moammar Gaddafi has been killed. Libyans are celebrating. Finally, they can freely add another color to their flag. Gaddafi has been confirmed dead. Some Libyans are not celebrating though. They know that Gadhafi, Qaddafy, Khaddafy, Gaddaffy, Quaddaffi, and Gaddaffi are still out there. 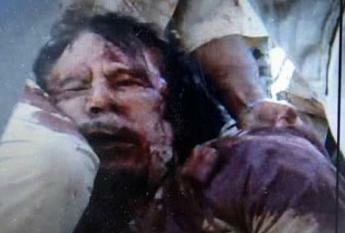 Reports say Gaddafi was killed by NATO-led rebels while attempting to escape. He was said to have been found in a hole in the ground. Also found were Gaddafi’s 3,000 pairs of sunglasses. The Libyan dictator is dead. Goodbye Moammar Gaddafi! Goodbye fabulous outfits! Early Thursday evening (Manila time), news organizations had conflicting reports about Gaddafi’s capture and death… which was not surprising since they could not even agree on how to spell his name. Reports say when Moammar Gaddafi was cornered by rebel forces, he tried to run. However, the dictator tripped on his long gown. There were also conflicting reports on how Gaddafi died. Some say he was shot. Others believe his thick robe suffocated him. 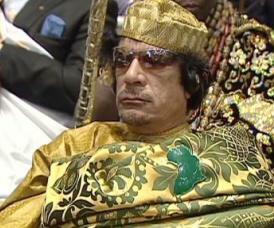 Gaddafi loyalists have issued a statement saying the Libyan dictator is still alive. They claim that he’s being treated right now at St. Luke’s Medical Center. This just in: One of Gaddafi’s son, Saif is offering an Hermes bag to anyone who could prove that his father is dead. Relatives of slain Libyan dictator Moammar Gaddafi are in a quandary. They couldn’t decide what version of Gaddafi’s name should they use on his tombstone. Gaddafi’s death was confirmed just hours after his convoy was attacked. If Gaddafi were a member of the CPP-NPA, his death would be confirmed in February 2012. 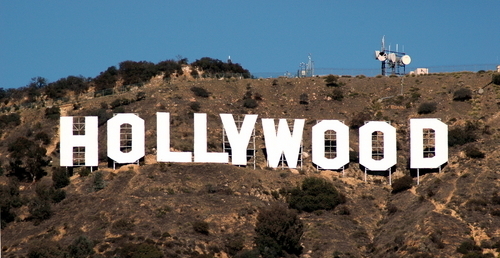 Batangas Governor Vilma Santos confirms there is a proposal to construct a huge sign on Taal volcano island similar to the “Hollywood” sign in Los Angeles. The actress-turned politician says “Our main goal is to reclaim Taal Lake and Volcano as part of Batangas.” Why? Who took it away? Governor Vilma Santos told the Philippine Daily Inquirer that the sign for the proposed structure would not spell out “BATANGAS” but “ALA EH.” Sing-stupid pero ‘di sing-mahal. Less than a month after humanity survived a crashing bus-sized satellite, a 2.6-ton, defunct German telescope called the Roentgen Satellite will crash back to Earth Saturday or Sunday (Oct. 22 or 23). Experts couldn’t say where it would land but i’m really hoping it hits the rebels who killed 19 soldiers in Basilan last Tuesday. FIRST, some bad news. 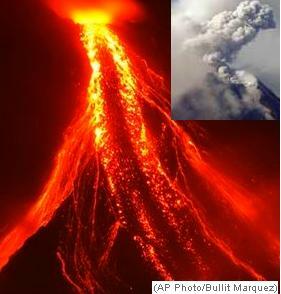 Mayon Volcano has erupted. The explosion has endangered the lives of Albay residents… prompting President Arroyo to declare martial law in the province. AGAIN, I would like to apologize for this delayed post. I promise to have regular updates after Christmas. Speaking of Christmas, a number of political personalities emailed me and asked why their own re-creations/re-enactments of the Nativity Scene were not mentioned in the previous post. I told them I was running out of time when I uploaded that particular post last Sunday. 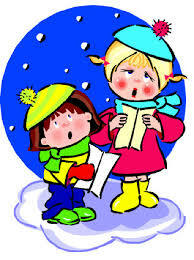 Nonetheless, I promised to feature their own Yuletide anecdotes in the succeeding posts. It’s the holiday season. It’s Christmas! The signs are all over: people flocking to Divisoria; Communist rebels declaring a truce with the government, and Satur Ocampo shaking hands with Bongbong Marcos! Makati City Mayor Jejomar Binay is perhaps the most consistent local executive when it comes to playing Santa to his constituents. He’s been doing that for 23 consecutive years! Instead of designating someone to buy stuff for him, Sen. Manny Villar himself did the shopping this year. The most expensive item he bought was Loren Legarda. Atty. Gilbert Teodoro had a difficult time shopping. So he just let Ronaldo Puno do the work for him. Something bad happened to the Nativity Scene created by Sen. Panfilo Lacson. The three kings who were traveling at night were mistaken for robbers and were ‘neutralized.’ Lacson accused Erap of masterminding it. 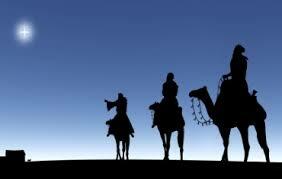 The Liberal Party’s re-enactment of the Nativity Scene was one of the most controversial. Serge Osmeña backed out from playing Jesus when he learned that Ralph and Vilma would play Joseph and Mary. In fairness to Lakas-Kampi-CMD, they did try to re-enact the Nativity Scene. They just couldn’t really complete the cast. The Roxas-Araneta family had a lavish Christmas party in which the Nativity Scene was reenacted. As expected, Mar Roxas played Joseph. Korina Sanchez was infant Jesus’ stepmother. Inquirer columnist Conrado De Quiros is giving away Transformers toys this year. He purchased both sets of Autobots and Decepticons… because he believes in toys that depict the battle between good and evil. Rumors say Korina was a no-show at the Christmas party of ABS-CBN News and Current Affairs… making it the group’s most enjoyable gathering in recent years. The Kapuso Network’s party for the press was well thought of. However, network bosses were reportedly alarmed when ABS-CBN’s press party got a higher rating from the attendees! 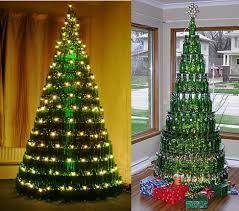 In terms of variety though, ABC 5’s Yuletide parties top them all. Every year, they celebrate the Holidays with new owners, new bosses, and new officemates. Finally, for the first time in history, the Philippine Daily Inquirer and the Philippine Star had a joint Christmas party. 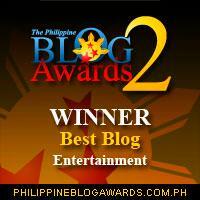 Thanks to their joint sponsor, Noynoy Aquino. Q: In Maguindanao, an unidentified person donned a Santa costume. He was really unrecognizable. But when he spoke three words, the kids around him yelled, “Andal Ampatuan Jr!” What three words did he utter? After watching them in a couple of presidential fora, who do you think deserves your vote in 2010? 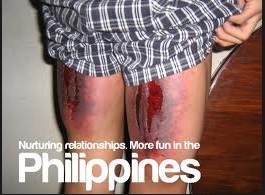 I’d like to thank Senator Chiz Escudero for the Holiday txt greets. Chiz’ thoughtfulness never fails to amaze me – despite the heckling. 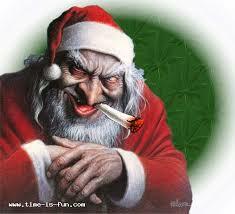 And to everyone who made this year a remarkable and memorable one for The Professional Heckler, Merry Christmas! To borrow Pacquiao’s line: Maraming salamat sa inyung supurta! Wannabe politician “Pennsylvania Michigan” was canoodling with “RhodeIsland Kentucky” when Pennsylvania Michigan’s other paramour, wannabe politician “Missouri Arkansas” arrived unannounced. Aides of Pennsylvania Michigan advised Missouri Arkansas to wait in the living room. After more than one hour, Pennsylvania Michigan and RhodeIsland Kentucky emerged from the room and headed downstairs. That moment, Pennsylvania Michigan felt like Brad Pitt torn between Angelina Jolie and Jennifer Aniston. RhodeIsland Kentucky’s dad is also seeking an elective post in the coming elections. 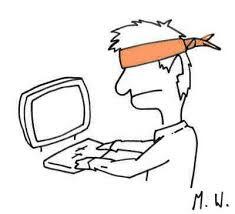 I just saw Bongbong Marcos’ new political ad. It says, “Tuloy tuloy… ASIKASONG BONGBONG.” Buhay pa pala siya?!? At bigla raw niya tayong “inasikaso.” Meh ganun?